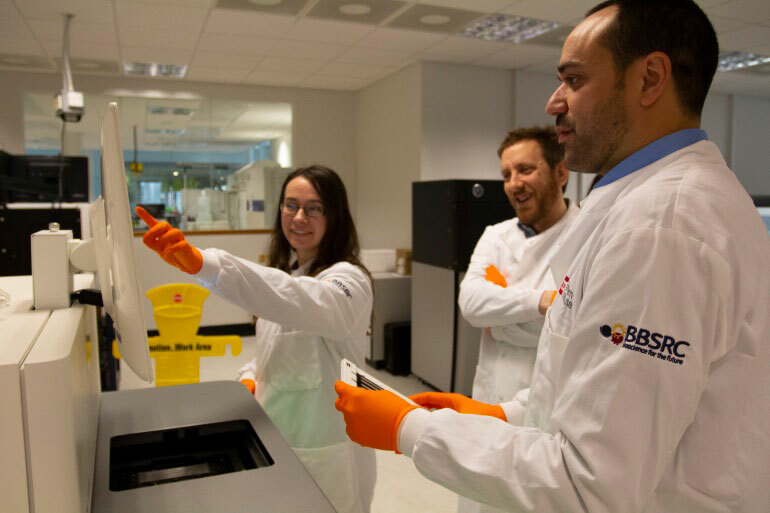 Earlham Institute (EI) add Illumina’s NovaSeq 6000 to its National Capability in Genomics and Single Cell Analysis, harnessing the power of ultra-high throughput sequencing for Norwich Research Park and the wider bioscience community. The new platform will increase its sequencing capacity threefold and enable big data science more rapidly and cost-effectively than ever before, with the ability to sequence up to six trillion bases in less than two days - the equivalent to 48 human genomes or nine wheat genomes. The state-of-the-art sequencing technology will make genome research more accessible to other institutes at NRP, industry partners and a global community of bioscience researchers - enabling scientists to decode the DNA of virtually any organism across the widest range of applications from basic science and agriculture to biotechnology and medicine. DNA sequencing has become a fundamental technology for bioscience research and EI has been at the forefront of sequencing advances for nearly a decade; releasing new technologies to the community and delivering high-quality data to hundreds of collaborators across the UK and beyond. The NovaSeq 6000 will complement the Institute’s unique suite of advanced technology platforms dedicated to the biosciences, including advanced genomics pipelines for DNA sequencing, cutting-edge DNA Foundry laboratories for synthetic biology, and one of the largest high-performance computing systems for life sciences in Europe. EI’s investment in the NovaSeq 6000 is supported by an advanced equipment grant from the UK Biotechnology and Biological Sciences Research Council (BBSRC), led by Prof Neil Hall at EI and with collaborators at Norwich Research Park. The rapid deployment of the NovaSeq 6000 will boost the continued success of the Institute's National Capability in Genomics and Single-Cell Analysis operated by EI, bringing the benefits of ultra-high throughput sequencing into the mainstream and accelerating new opportunities for academic and commercial research. The performance and capability of EI’s NovaSeq will initially be evaluated by pilot projects in collaboration with the John Innes Centre, Quadram Institute and the University of East Anglia, including novel approaches to capture genetic diversity in wheat, identification of self-incompatibility genes in primrose, and a study of the chicken gut microbiome. Prof Hall and his collaborators plan to present their early findings at the UK Genome Science 2018 in Nottingham. Funded by the government, BBSRC invested £469 million in world-class bioscience in 2016-17. We support research and training in universities and strategically funded institutes. BBSRC research and the people we fund are helping society to meet major challenges, including food security, green energy and healthier, longer lives. Our investments underpin important UK economic sectors, such as farming, food, industrial biotechnology and pharmaceuticals.